LEGO helps you make robots. This set the LEGO Creator Rescue Robot will make a great looking rescue robot and it even has a light stone so you can see the robot in the dark. And when you are done with this robot then just rebuilt it to one of the other included designs the laserbot and Robocat. All 3 robots in one little box of LEGO that will be fun. 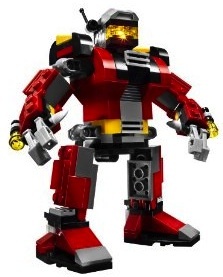 Go check out the LEGO Creator Rescue Robot.